This is a family favorite in our home. It is not only beautiful, it is also light, flavorful and healthy. If you have leftover rice, you can make it in less than 20 min. You will need to make a trip to an Asian market for dashi powder though. Instant Dashi powder. Dashi powder is a fish soup stock essential to Japanese cooking. I don’t think you will regret the effort to get ahold of this. I will post a chicken soup in the near future, which also uses dashi powder. And I have a feeling, that if you give this soup a try, you will be glad you have dashi powder in your pantry. Just a hunch. Cook fresh rice or warm leftover rice. Bring the water to a boil in a pot and turn the heat off. Add the green tea bags and leave in for a few min. Heat sesame oil in a pan and fry the salmon. Add instant dashi powder, mirin, soy sauce and salt to the green tea. Add green onions. Heat the soup, but do not boil. 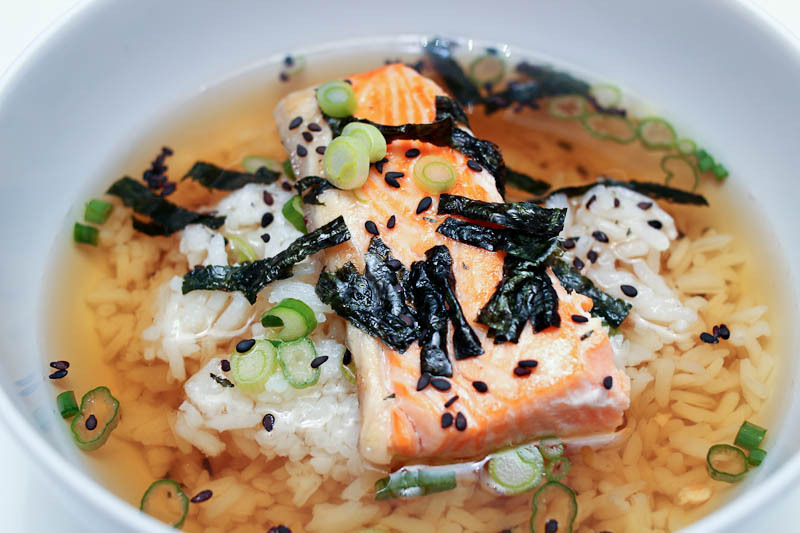 Serve in bowls: first rice, then soup, then salmon, then topping. The inspiration for this soup comes from a Danish cookbook called Japansk mad på dansk, Japanese food in Danish. I have added soy sauce and mirin to the original recipe. You can leave both out and serve with wasabi to add more flavor. This entry was posted in Asian inspiration, Dinners in 30 min or less, From the sea, Rice, grains & pasta, Soup time and tagged Dinner in 30 min, healthy food blog, japanese food, japansk suppe, laksesuppe, leftover rice, recipes, rice, salmon, soup, stine lavigne, Suppe med ris. Bookmark the permalink. This recipe must be tested – off to Asian market …. 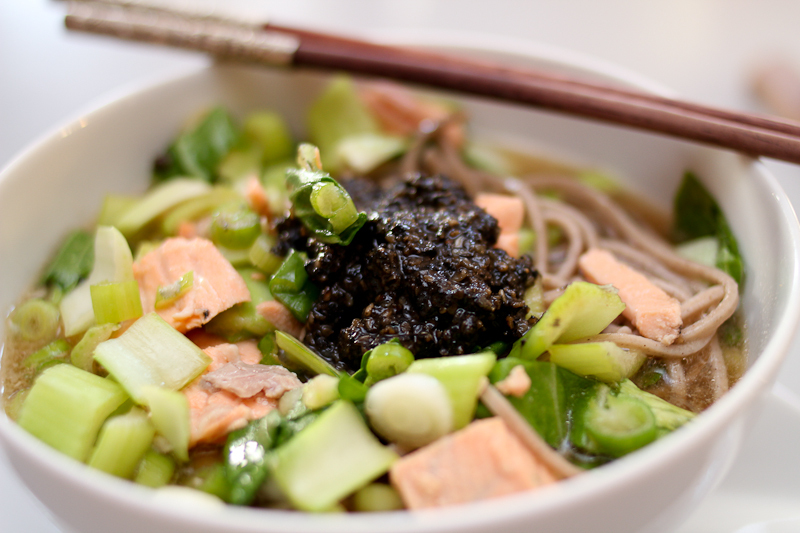 I love salmon, Asian food and especially soups…and all put together…wow!! I must try it! Thank you both for your feedback! Much appreciated. I can reveal that the soup tastes as good as it looks At least I think so and I hope you do too. I would be grateful if you have time to share what you think about the soup, when you have tried it.